Ancient Mayas used watchtower-style structures at the temple complex of Chichen Itza to observe the equinoxes and solstices. MEXICO CITY — Mexican archaeologists say they have determined that the ancient Mayas built watchtower-style structures atop the ceremonial ball court at the temples of Chichen Itza to observe the equinoxes and solstices, and they said Friday that the discovery adds to understanding of the many layers of ritual significance that the ball game had for the culture. The structures sit atop the low walls of the court, where the Mayas played a game that consisted, as far as experts can tell, of knocking a heavy, latex ball with their elbows, knees or hips, through a stone ring set in the walls. 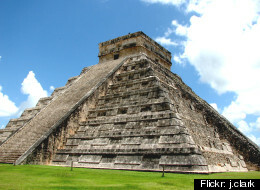 More - Link >>> http://www.huffingtonpost.com/2012/10/05/mayan-ball-court-chichen-itza-celestial-marker_n_1942865.html. Sources: Associated Press, The Huffington Post. Mars: Mysterious "Spidery Black Things"
Where is Mars Moon Deimos?